Select your tractor HORSEPOWER to view compatible products! Our dealers are ready to help you find the right backhoe for your tractor. 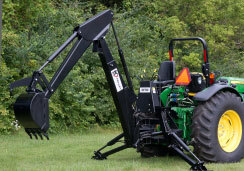 This backhoe is compatible with 50-150 horsepower tractors. High-quality materials mean our hydraulic cylinders are made to last. 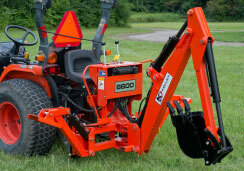 The B70 is suitable for 60-150 horsepower equipment. Experience more room & superior comfort with an adjustable folding seat. The compact design of the B600 makes it great for those hard-to-reach locations. It’s easy to mount and detach, giving you options and versatility. 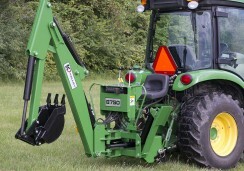 If you have a 20-45 horsepower tractor, this is the model for you. 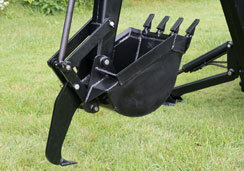 Three-point mounting gives this small backhoe maximum digging power. This unit will mount to skid steers. 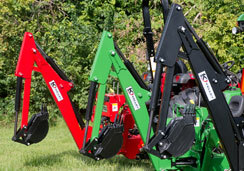 Kelley carries a complete line of backhoe buckets, parts and accessories. Not sure which part you need? Just ask! Become a part of the longstanding Kelley tradition of excellence. We are accepting applications for participation in our dealer/distributor network. For more than 100 years, Kelley Manufacturing has produced high-quality backhoes that are tough, reliable, affordable and made in the USA. From the family farm to the job site, Kelley’s heavy-duty products are designed to perform, and designed to last. Our backhoes are compatible with almost every brand of tractor, including compact tractors and skid loaders. No matter your brand of choice, Kelley has you covered. Find your fit by selecting your tractor’s horsepower and browsing a list of compatible products. 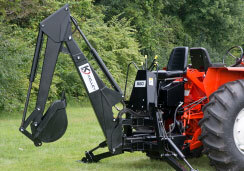 Already own a Kelley backhoe? We also carry a complete line of parts and accessories. Register a new product or update existing info. Get a new decal. Apply to become an official Kelley distributor/dealer.